On Saturday, December 1, NWU President Larry Goldbetter and executive committee member A.J. 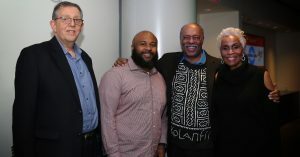 Springer were recognized for their work in getting Ebony freelancers paid at Richard Prince’s 9th Annual Journal-isms Roundtable Holiday Party at the Newseum in Washington, D.C.
Journal-isms covers all aspects of Black media and is a leading voice for diversity in publishing. Prince was one of the early journalists to shine a light on the union’s highly publicized battle with Ebony Media Group on behalf of 45 freelancers, and also covered the union’s grievance with Heart & Soul dating back to 2012, where about 20 freelancers won $150,000. The highlight of the night was Courtland Milloy’s interview with Dorothy Gilliam, the first Black woman reporter at the Washington Post in 1961. Her new book, Trailblazer, is due out this January. Dorothy’s story is yet another example of how, no matter what aspect of US society you examine, Black people have endured. The discussion gave us a deeper appreciation of how entwined inAmerica’s DNA racism is, and how the struggle for respect and equality has been aided by the contributions of people like Gilliam in every aspect of Black life. Thank you, Richard Prince, for the invitation and for your contribution to journalism.